We set off from Silsden in the Mini Transporter on Friday 23rd Dec and made our way to Samantha’s home town Malvern. Spending a couple of days there over Christmas before leaving for Coventry on Tuesday morning. Dad was bringing mine and Danny’s F1s down, so on arrival we left a space for them to park next to us. Already the pits are buzzing, the weather remained mild, maybe this bought more people out? By the time the meeting started I was surprised to see how big the crowd was and everyone seemed to be in good spirit! The minis are out first, and for a change the format is run differently – the grid positions are pulled out from a hat. Phoebe and Frankie pull 10th and 11th, near the back so no favours! The track conditions are not too good, lots of sloppy mud so not ideal for the first race of two. Both get off to a good start and are making good ground. Phoebe manages to get up to third place but hot on her tail little Frankie pulls her in and passes. He’s going really well and finishes in third place; Phoebe finishes fifth. 264, say no more! The one and only Garry Lenton. Now it’s my turn. There’s a few good lower graders racing today including Garry Lenton 264 who shows that he hasn’t lost his touch! My brakes didn’t feel too good at the beginning of the race and then I half spun on the wet stuff! Despite this I managed to get into first place. I could see Ryan Harrison catching me up and on the last bend I went in wide expecting him to give me a slap! I’m glad I did as Ryan came in hard, thankfully didn’t make contact with me as I went on to win the race. Minis are back out and Little Frank gives me the thumbs up as we pass each other on the track. Another good smooth race by both, Frankie shows his sister the way round as he passes and gets another 3rd place leaving his sister to finish in sixth. I line up for the final. We didn’t alter the car as its felt good. Ryan Harrison gets a good start and pulls some ground on me, to be honest didn’t think I’d catch him. But with my race running smooth and no problems I find myself pulling him in and pass him to take the win. I see my old friend Higgi (29) in front and can’t resist giving him a tap for old time’s sake! 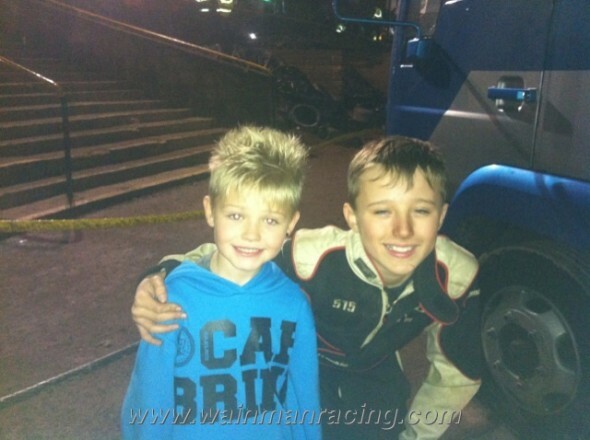 Frankie JJ with Will Yarrow's number one mechanic. Phoebe and Frankie are out for their final. Once again little Frank’s going well but as he tries to avoid some cars he clips the kerb. A few laps later he gets a flat, but despite this he still gives a couple of more experienced drivers a run for their money and manages to finish about 8th place just behind his sister. The F1 Grand National is out next. I take a lap handicap and the car feels mint! A good race without any yellows and I manage fourth. So a great meeting, thoroughly enjoyed the atmosphere and seeing everyone. Great to see Higgi and Garry Lenton back out and I’m sure they really enjoyed themselves! Many thanks to sponsors, mechanics, family, fans & friends for your support during 2011, here’s to 2012! Aotearoa Ladies Crown, New Zealand. 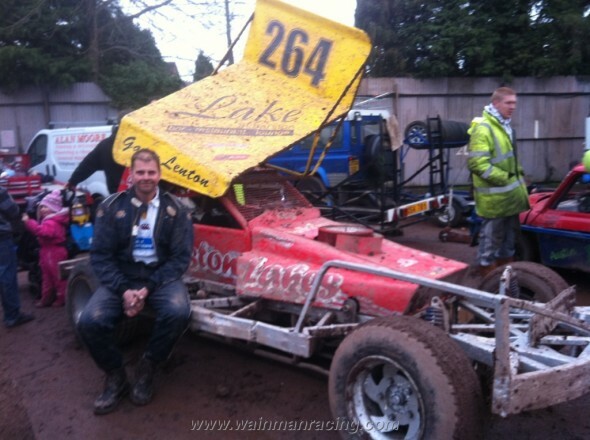 Welcome to the Official website of Wainman Racing. 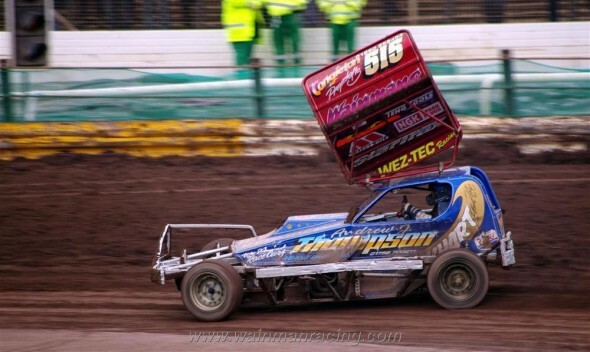 Here you can follow the racing adventures of BriSCA F1 Stock Car drivers Frankie Wainman Jnr and Daniel Wainman, V8 Hotstox driver Phoebe Wainman and National Ministox driver Frankie Wainman Junior Jnr. 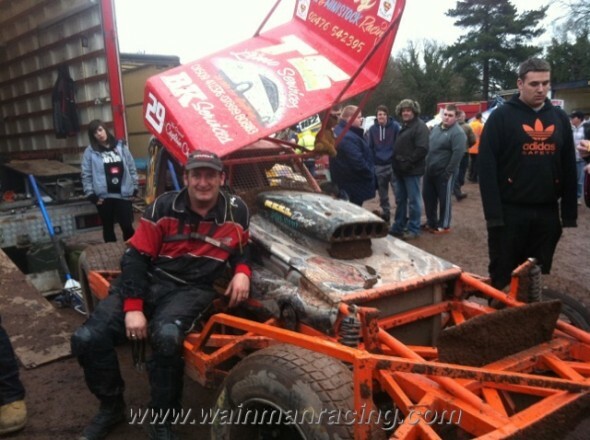 The site also provides a contact point for UK short oval racers to get in touch with the FWJ Racing workshop.